Only a bit over three months left of 2018 and the silly season is almost upon us. Everyone in Australia knows that the country shuts down in early November with the Melbourne Cup and doesn’t start up again until the end of January. As I don’t go to the races, have no travel plans for the summer and don’t drink alcohol this annual idiocy-fest should not affect me. But I am filled with fear and trepidation because I have so many writing projects which were going to be released “by the end of the year”. Score so far: NIL. It’s not as if I haven’t written them. Almost all have been through several edits, I have a production method in hand, cover artists lined up … one final edit each, I say to myself, and they will be ready to go. I so much want to do this, because there are new writing projects I want to start. Sure, there are lots of things that get in the way of finishing books, ordinary life stuff. That’s bad enough. But now I am suffering a crisis of confidence. Maybe I should just embrace the silly season and forget about writing altogether, apart from dumb “Season’s Greeting” cards. Or I should take a leaf out of my own (unpublished) cook book and get going on the cakes and puddings. At least I could sell them at a cake stall! A few short years ago independent publishing seemed so clearly the way to go. But it seems more and more difficult to get any purchase at all with the reading (buying) public without a huge effort in marketing strategy and general non-writing activity. Writing itself takes second place. I need to get serious, not about writing, but about the “writing career”. Everyone says you have to do it, and lots of people tell you how. Using the Internet strategically is obviously top of the list these days. Don’t get me wrong, I love the Internet and have done ever since it debuted back in prehistory, well, the early 90s or whenever it was. I love my blogs, both the writing and art sites, it feels truly creative putting them together, but I do that because I love it, not to build a following or expand an email list. I am a member of the Alliance of Independent Authors and they put out some great stuff. but tweeting is troppo mucho and Facebook gives me a kind of hysterical indigestion, yes, I know, I shouldn’t have subscribed to those I-Love-Cats sites but there was a reason for that, believe it or not, although I won’t go into it here. No, the real problem is I can’t wholly see myself as someone “building a writing career”. I am a writer, I love to write, writing is what I do. If I have any time at all, like those precious two or so hours before the world wakes up in the morning, I want to spend it writing or editing or thinking about better turns of phrases for titles or thinking about how to improve a story or how to introduce some new themes. I don’t want to spend it building my email list or tweeting or whatever. It’s bad enough that I have had to go through so much time just working out how to produce a workable manuscript which will go through the publication process smoothly, and identifying useful information sites to follow. But now I see I have to see I have to Put Myself Out There as well. This morning I came across an article by Wendy Jones called How Being an Opportunist Helps Build Your Writing Career (republished 5 September 2018) here. This article really made me realise that I just didn’t have the right frame of mind to be a successful Independent Author. Just not opportunistic enough. Read it and weep! On the other hand maybe I should go to the Melbourne Cup and hand out leaflets urging punters to buy my books! Now that’s an opportunity. After life as an anthropologist, including years of fieldwork in remote Australia and Southeast Asia, I am now working on painting, photography, art and cinema and publishing fiction, memoir and children's stories. 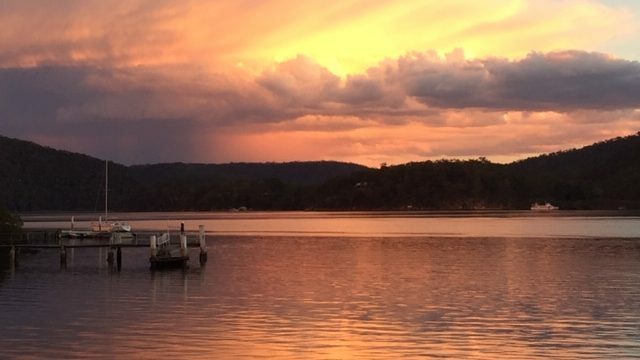 I spend most of my time in the Blue Mountains west of Sydney and at a house on the Hawkesbury River, where my family has lived since 1923. Previous: Amazon creates NoSpace for Australian authors: Ingram Spark to the rescue? Next: More on opportunism: hire an actor!